An International soccer governing body FIFA came into existence in 1904. The aim of the organization was to host championship matches between professional leagues from different nations. The Fédération Internationale de Football Association (FIFA) first conceived the idea of world cup soccer championship as early as 1926. The FIFA President Jules Rimet thought of an event that would fall in between the Olympics. The original idea did not work well to the outstretched hosting of the winter and summer Olympics. Rimet along with other FIFA representatives first organized the event in 1930. The very first world cup did not even include qualifying rounds. Teams from Europe included France, Belgium, Yugoslavia & Romania. Other European teams complained about the distance to Uruguay and refused to travel so far. The original gold trophy had the name of Jules Rimet’s carved on the trophy and it was contested three times in the 1930s. There were a total of 13 teams in the first world cup. The remaining countries besides the host Uruguay were Argentina, Brazil, Bolivia, Chile, Paraguay, Peru, Mexico and the United States. Due to the II World War, the competition was put a 12-year long halt. The first world cup soccer match started on July 13th, 1930. France defeated Mexico in a game of 4 to 1, paving way for a glorious world cup beginning. After the war, the FIFA World Cup gained worldwide recognition as the sole sporting event of the new world. The World cup has been held since 1958 in Europe and the Americas. The World Cup Executive Committee’s decision in May 1996 made a major decision of selecting Korea and Japan as co-hosts for the 2002 edition. Ever since 1930, the world has witnessed only seven different winners in the 16 tournaments held so far. The FIFA World cup has seen wonderful victories and some dramatic twists such as England’s defeat in 1950, North Korea’s loss in Italy in 1966 and Cameroon’s opening match defeat of Argentina in 1990. 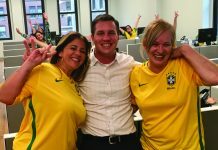 FIFA World cup today draws people from all over the globe. After so many years, the world cup has seen the best and the worst in the sphere of soccer. The soccer world stands taller in recognition and popularity with the FIFA world cup. Soccer is the most loved and admired game with a history of over 3000 years.